Diamonds are cut into numerous shapes, with the most popular being round brilliant. Please select the shape that most closely resembles your diamond. If you are unsure, check "I don't know" and we will tell you in the appraisal. A Mounting or Setting refers to the metal composing the diamond. Often the design of the mounting will includes= accent diamonds or side stones for the center diamond, which is called a semi-mounting. We accept a variety of jewelry with diamonds, as well as loose diamonds. Select the setting that best describes your diamond. The only way to determine a diamond’s actual weight accurately is by placing it on loose on a well-balanced and calibrated diamond scale. There are however ways to estimate weight based on measurements for both loose and Jewelry mounted diamonds. We invite you to contact us so we can assist you in estimating your diamond’s weight. 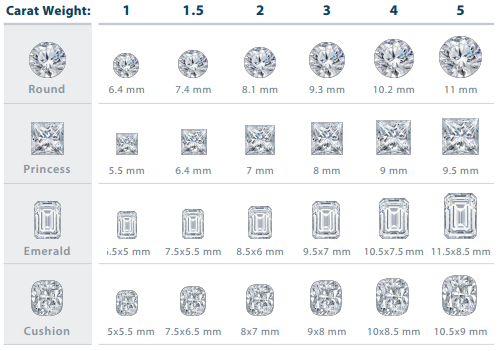 Select your diamond's estimated weight. A Diamond's color refers to a grading scale for diamonds in the normal color range used by internationally recognized laboratories (GIA & IGI for example). The scale ranges from D which is totally colorless to Z which is a pale yellow or brown color. Diamond clarity refers to the existence and visual appearance of internal characteristics of a diamond called inclusions, and surface defects called blemishes. We will help you understand clarity of your diamond during the appraisal process. There are several professional schools and associations of gemologists and certification programs around the world, with the most popular being the Gemological Institute of America and the American Gem Society. If you hold any certifications or have received an appraisal previously, please list it below and attach an image or the document. Select the certifications you hold for your diamond. Please provide a brief history of ownership of your valued asset. We accept many forms such as a certificate, statement from the original owner, etc. Do you currently own the diamond? Please provide a brief history of ownership of your valued asset. We accept many forms such as a certificate, statement from the original owner, etc. which you can attach below. Please attach images of the actual diamond and copies of all relevant documentation proving ownership.